Following two tough losses to Florida State and Miami, Boston College volleyball had hoped to turn things around with its games against Louisville and Notre Dame. But the Eagles ultimately came up short as they continued their eight-game losing streak, with a loss to Louisville in five sets and to Notre Dame in straight sets. With only two days to prepare for their match against Notre Dame (15-3, 6-0 Atlantic Coast), the Eagles (5-11, 0-6) had bad luck, and not just because of the rain. The Fighting Irish took an early lead of 5-1, visibly shaking the Eagles as they fell farther and farther behind. Things started to look up when McKenna Goss won three points in a row for the Eagles. After a service error and a failed block that forced BC into a timeout, the Eagles lost the first set, 25-18. In the second set, BC needed to communicate in order to get past the tough defense of Notre Dame. The set didn’t start out very well for the Eagles as the Irish took another early lead, winning three consecutive points and starting out the set, 3-1. Things improved for the Eagles as Anna Skold and Goss matched the score at 4-4, but they couldn’t continue the scoring streak as Notre Dame’s Jemma Yeadon and Rebecca Nunge responded with three more points. The Irish ran away with the second set 25-21, and BC couldn’t find its rhythm on the court. The Eagles were cautious at the start of the third set, allowing Notre Dame to win four uninterrupted points early on. 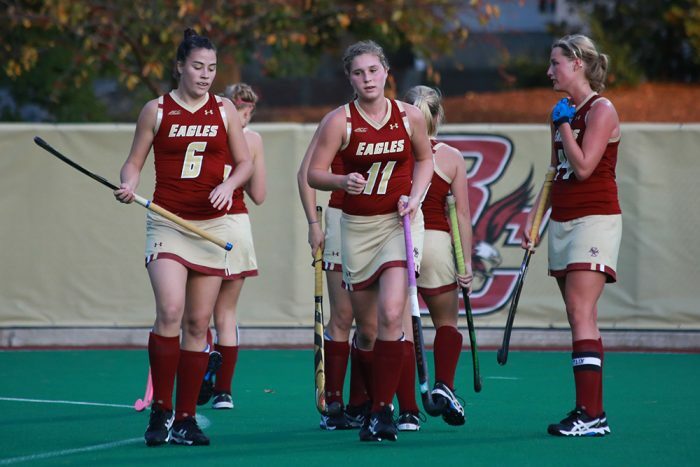 After quickly falling behind 8-4, BC was forced into a timeout, a last-ditch effort that proved futile as the Irish won seven consecutive points. BC lost to Notre Dame, 25-12, in the third set, a straight-set defeat. Against the Louisville Cardinals on Thursday, the Eagles took an early lead. Louisville’s first serve fell outside the lines, giving BC the first point of the game. The lead didn’t carry, however, as the Cardinals (6-9, 1-4) responded immediately with two points. The set was tied at six with a kill by Goss, but the Eagles fell behind once again when Louisville took three straight points after technical mistakes made by BC. The rest of the set followed that pattern, with BC tying up the points and Louisville pulling ahead. The tide turned when BC pulled ahead of Louisville with a service error by the Cardinals followed by a kill from Sol Calvete, giving the Eagles a 20-19 lead to force a Louisville timeout. The Cardinals then called a second timeout when BC pulled ahead 23-21 with a kill by Sophia West. BC won the first set 25-23 after a net violation by Louisville. Early in the second set, Louisville pulled away with an early 2-0 lead after a net violation and double contact of the ball by BC. The Eagles looked like they had a chance when they took three straight points, giving them an edge of 13-11. But the streak was short-lived when a service error made by BC led to Louisville winning four points in a row to take a 15-13 lead. The short break proved unhelpful, with Louisville winning two more points. The Eagles ultimately fell 25-18 in the second set. BC came into the third set looking like a different team. The Eagles took home seven points immediately, forcing a Louisville timeout. The closest the Cardinals came to BC in the third set was when it trailed behind 16-11, but the Eagles then ran away with the set 25-14. Unfortunately, BC couldn’t keep the ball rolling and fell to Louisville in the fourth set, 26-24, after taking an early lead. BC ultimately fell in the fifth set as well, losing 15-12 and going home with another loss. Head coach Chris Campbell noted how tough ACC matches can be.